This Ealing X15 Reflecting Objective is Ealing Part Number 25-0506-000, which means it is a 15X magnification, Bare Aluminum finish. 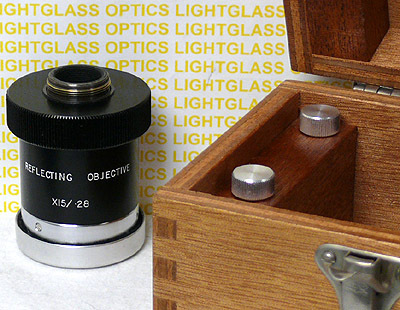 The reflecting objectives are desirable in that they have no chromatic aberration. This also has a working distance of 24.5mm, and will allow cover glass thickness of up to 3mm. The mount is a standard RMS mount, so it will fit most microscope noses.